It’s time to share progress on the SAL project again today. The good news is that I have a Happy Dance. This is where I left off last time. Here is the finished piece. 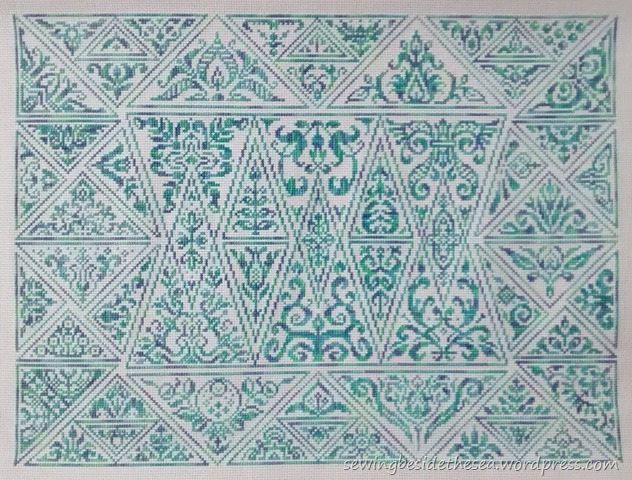 The design is called Cirque des Triangles and it’s by Ink Circles. It’s been a pleasure to stitch. Here’s a close up of the middle section which shows off the colours much more realistically. I’ll be framing this one and it’ll be hanging with the other two that I’ve already completed from the set. I’ve stitched three out of the four now and might just fancy doing the last one. Maybe Santa will treat me (again). So, this means I’ll be starting a new project next time. Me and Claire have had our heads together and we’ve chosen something we nabbed in the January sales. All I’m saying for now is that it’s completely different to anything I’ve ever stitched before. Everyone else in the group is doing something different. Please take a look at how they are progressing with their own chosen SAL project. I promise you won’t be disappointed, maybe even inspired. We’ve also got a new member to welcome aboard this time. Just click on the names below and you’ll hop over to their blogs. Jackie is our new member. We live all over the world so you may need to allow for time differences but we post local time, every third Sunday. Our next updates will be posted on the 8th October 2017. See you then! Everyone else in the group is doing something different. Please take a look at how they are progressing with their own chosen SAL project. I promise you won’t be disappointed, maybe even inspired. Just click on the names below and you’ll hop over to their blogs. We live all over the world so you may need to allow for time differences but we post local time, every third Sunday. Our next updates will be posted on the 17th September 2017. See you then! This is the first of the last three stages which will complete the centre panel. These bits were quite stitch intensive compared to some of the others. You can see the whole design by visiting Claire’s blog. She’s stitching the same one as me but in different colours. She doesn’t have the fabric wound around the frame like me. Everyone else in the group is doing something different. Please take a look at how they are progressing with their own chosen SAL project. There’s some jaw-dropping stitching going on in this group and we also have two new members, Heidi and Connie, to welcome this time. Just click on the names below and you’ll hop over to the other blogs. We live all over the world so you may need to allow for time differences but we post local time, every third Sunday. Our next updates will be posted on the 27th August 2017. See you then! Here we are again with SAL updates for the second time in June. This design is by Ink Circles and it’s called Cirque des Triangles. Here’s where I was up to last time. Me and Claire have been stitching along the bottom this time. We are both stitching the same design but everyone else in the group is doing something different. 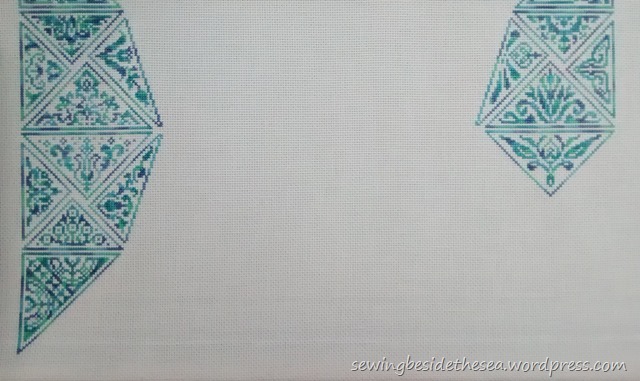 Claire uses a different kind of frame to me so you’ll be able to see what the whole thing looks like so far in her colour choices if you hop over to her blog. Please take a look at how everyone else is progressing with their chosen SAL project. There’s some amazing stitching going on and you might just be inspired by some of the handywork of the other participants. Just click on the names below and you’ll hop over to their blogs. We live all over the world so you may need to allow for time differences but we post local time, every third Sunday. Our next updates will be posted on the 16th July 2017. See you then! How did it get to 4th June so quickly? Time has flown so far this year. Anyway it’s time to share my progress on the SAL project again today. 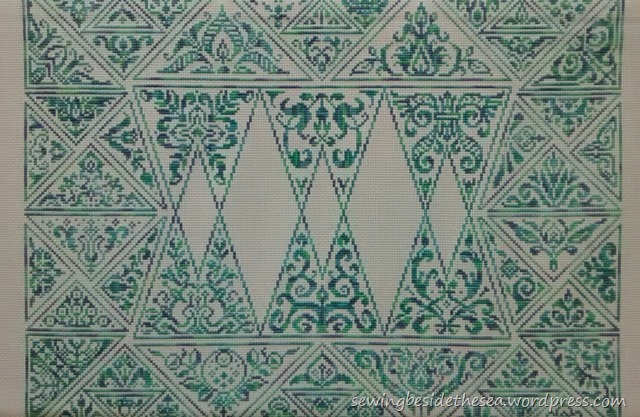 This design is by Ink Circles and it’s called Cirque des Triangles. Here’s where I was up to last time. Here is stage 6 all done. 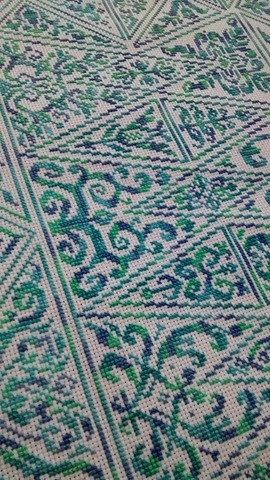 You can see the colours in the thread a bit better in the close up. As you can see I’ve got the bottom right side done and we’ll be stitching along the bottom next time. My fabric has been rolled around the frame so you can’t see the top. 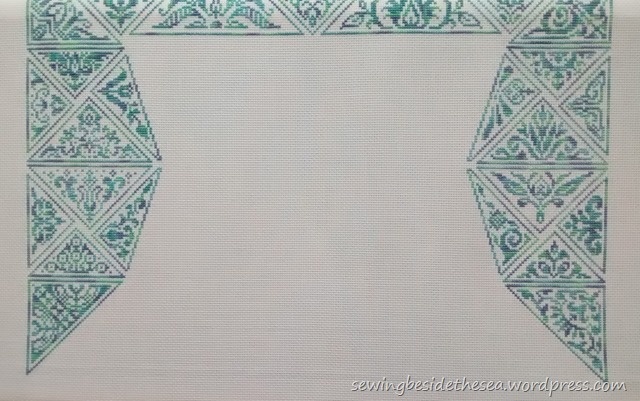 Claire is stitching the same design as me and she uses a different kind of frame so you’ll be able to see what the whole thing looks like so far in her colour choices if you hop over to her blog. Our next updates will be posted on the 25th June 2017. See you then! It’s time to share my progress on the SAL project again. 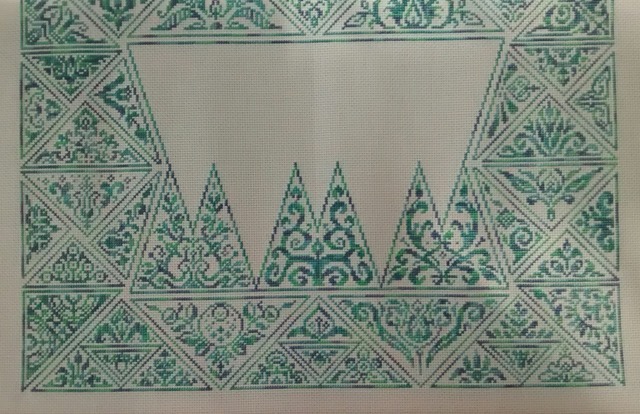 This design is by Ink Circles and it’s called Cirque des Triangles. Here’s where I was up to last time. I’ve now got the bottom left side done but the fabric has been rolled around the frame so you can’t see the top. Claire doesn’t use the same kind of frame as me so you’ll be able to see what the whole thing looks like in her colour choices if you hop over to her blog. Next time I hope to show the bottom right corner completed. That means you won’t see the top again until it’s all finished because I’ll need to roll the fabric around the frame. Please take a look at how everyone else is progressing with their chosen SAL project. Just click on the names below and you’ll hop over to their blogs. We live all over the world so you may need to allow for time differences but we post local time, every third Sunday. Our next updates will be posted on the 4th June 2017. See you then! Moving on down the right hand side this time. Next time I hope to show the bottom left corner completed. That means you won’t see the top again until it’s all finished because I’ll need to roll the fabric around the frame. Our next updates will be posted on the 14th May 2017. See you then! The last three weeks have flown by and Spring is finally here! I do like it when the clocks move forward an hour to give us lighter evenings. Anyway, it’s time to share my progress on the SAL project again. 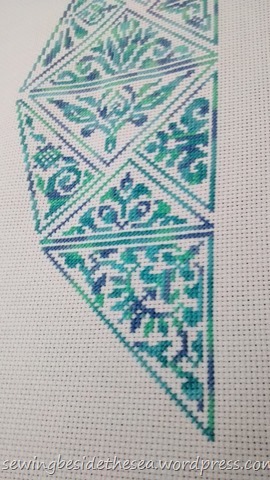 This design is by Ink Circles and it’s called Cirque des Triangles. Here’s where I was up to last time. All of the top except the centre triangle was completed. If I didn’t have other things to do this project would have been well on the way to completion by now. It’s so enjoyable not having to change thread colours. Please take a look at how everyone else is progressing with their projects. We’ve got two new members this time. Mary Margaret gets up to all sorts of lovely cooking, gardening and crafting. Timothy has chosen to stitch a huge cross stitch project for the SAL but he also enjoys several other crafts. Just click on the names below and you’ll hop over to all the member’s blogs. We live all over the world so you may need to allow for time differences but we post local time, every third Sunday. Our next updates will be posted on the 23rd April 2017. See you then! It’s time to share my progress on the SAL project again. In fact, it’s all I’m posting about these days. I don’t seem to have enough spare time to either write or stitch at the moment and I’ve nothing much going on worth writing about. Decorating and spring cleaning has taken over! However, I’m not complaining. The house was well overdue some TLC and I’m enjoying the results. Anyway, this design is by Ink Circles and it’s called Cirques des Triangles. Here’s where I was up to last time. The top left corner was completed. This is where I’ve got to now. This is as wide as it gets. 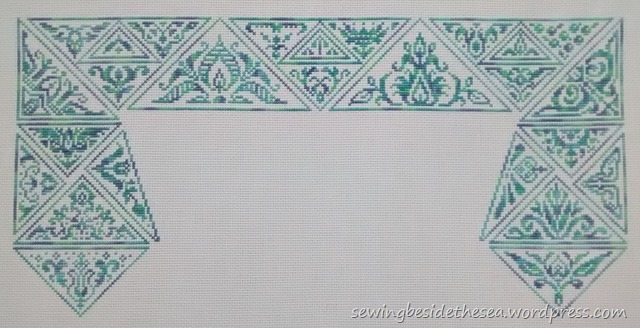 If you pop over to Claire’s blog you’ll see her version in completely different colour choices. 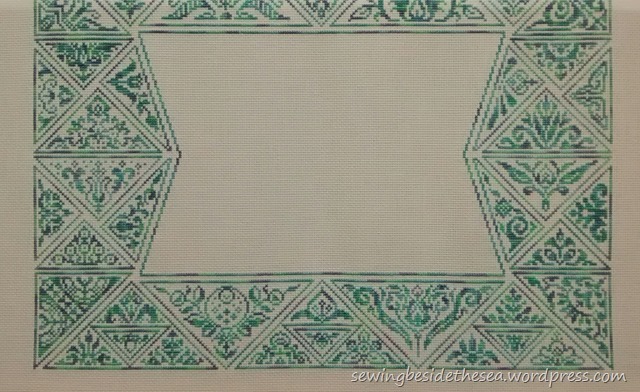 It’s amazing how different the same designs can look with a different thread and/or fabric. Our next updates will be posted on the 2nd April 2017. See you then!